Ok, not literally. But this blog is moving. Again. "I have a daughter." I am still getting over the amazement that makes the previous statements true. "I'm going to be someone's parent, and that someone is inside Rita's tummy." All things that I simply can't begin to understand. My brain can hardly remember how to put a sentence together. Life is pretty rad. This was Kyle's "status" on facebook. And I thought it was too special to let it get lost in the clutter of facebook forever. So I put it here where I can remember it. I am surprised at what a big difference yesterday made. We're having a little girl. We know her name. 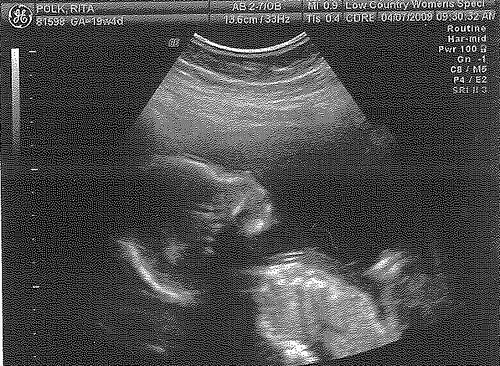 And, with our very patient ultrasound tech "in control", we could see and hear her heart beat, and we got to watch her wiggle around, move her mouth like she's already trying to talk (I'll save the Peanut Gallery some effort -- yes, she's like her mom already), fiddle with her hands, kick her little feet around. And we marveled at her little personality already beginning to show itself. For a few minutes, we watched her and were really fascinated the whole time. She's a baby - our baby!! Crazy!! I've been feeling her kicking around for a couple of weeks now. Kyle hasn't been able to feel her yet, (though my mom did very briefly over the weekend) but he definitely likes to try. It seems like if she's moving around and we put a hand over her, she settles down. So, while it's sweet that she already finds comfort from our touch, it's disappointing because I really want Kyle to be able to feel her kicking around in there. All in due time, I suppose. I've heard stories from expecting mothers whose husband's are musicians and whenever the baby hears their daddy start playing, they dance all around. I've always kinda hoped for that - some kind of recognition of "That's my dad!" from the baby (silly, perhaps). But just watching her being so laid-back yesterday made me know that she's reacting completely naturally - being herself. 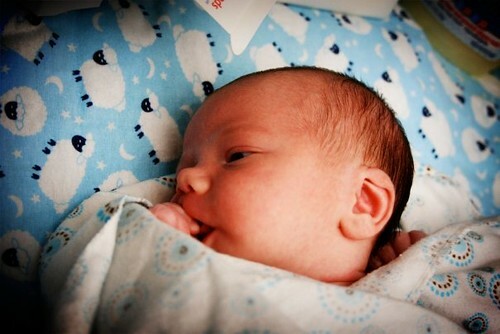 Besides, her dad plays the drums so often, it's probably just as natural for her as hearing her mom snore at night!